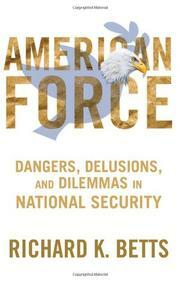 Betts (Enemies of Intelligence: Knowledge and Power in American National Security, 2009, etc. ), the director of the Saltzman Institute of War and Peace Studies at Columbia University, surveys the landscape of American national security with a dispassionate and analytical eye. Placing current issues in their historical context, the author begins with the evolution of NATO from a mutual defense pact into a new political club and a means of extending American power into the “New Europe.” The end of the Cold War freed America to use force "on behalf of the so-called international community," but too often its poorly conceived interventions prolonged suffering instead of relieving it. Betts criticizes a "profoundly confused" policy that "abetted slow-motion savagery" in Bosnia, for example, and recommends a set of standards by which to determine when military intervention for humanitarian purposes is likely to be a worthwhile option. The author also explores the nature of the changing threat from WMD, appropriate responses to terrorism and insurgency, serious concerns about the possibility of military conflict with China, appropriate levels of defense funding and whether the entire concept of strategy in military affairs has any meaning. “The expansive concept of national security carried over from the Cold War, when it was necessary, to the unipolar world, when it was tempting,” writes Betts, who advocates for “less ambitious uses of force for world ordering in the near term, present concentration on forceful counterterrorism and nonforcible counterproliferation.” While he recognizes the ongoing need for military force as a foreign-policy option, he cautions that America should avoid bluffs and either go all in or stay out. Betts does not shill for any particular ideology; he presents closely, sometimes densely reasoned arguments for his conclusions.